According to the South Carolina Encyclopedia, Frogmore Stew originated in the Frogmore community on St. Helena Island near Beaufort, S.C and has been a staple in the community at dinner tables and social events ever since. 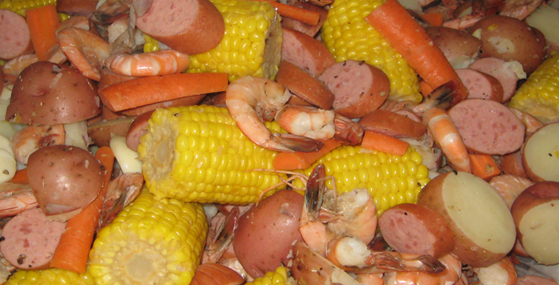 Coastal regions in the south have variations of the stew where it is also known as “Low Country Boil” and other ingredients such as crawfish, crab and oysters are added. Frogmore Stew is best served on a newspaper-covered table either indoors or out on a dock, eaten with the fingers and shared with family and friends while enjoying some frosty beverages. Fill a large steamer pot halfway with water. Add Old Bay® seasoning (or more to taste). When the seasoned water comes to a boil, add redskin potatoes and boil for 20 minutes; then add one-inch slices of spicy smoked sausage and boil for 5-10 minutes. Add the corn and boil another 5 minutes. Then add the shrimp. Be careful not to overcook the shrimp! Cook for 3 minutes, drain, and pile on a table. Serve with lots of paper towels and icy beverages, plus melted butter for the corn.